BERLIN, Aug. 30, 2018 — LG Electronics (LG) will be prioritizing its LG ThinQ brand at IFA 2018, spotlighting its innovations and vision at the prominent tradeshow in Berlin, August 31 to September 5. LG will be highlighting how its advanced LG ThinQ solutions are designed to make technology-powered radical lifestyle transformation a reality for users worldwide. More than one-third of the company’s massive IFA exhibition space will be centered on AI, with a range of LG ThinQ products displayed in three different lifestyle zones: ThinQ Travel, ThinQ Gourmet and ThinQ Style. Each zone will be expertly designed to reflect the diverse lifestyles of modern consumers and will incorporate AI products into natural yet futuristic home environments. The distinct zones will illustrate how LG ThinQ presents benefits for every aspect of life in vital areas such as style, cuisine, home comfort, mobility and entertainment. The ThinQ Travel zone will demonstrate just how easy it is to search for the perfect holiday destination via LG AI TVs and then book flights and accommodations using the LG G7ThinQ smartphone. The Google Assistant will soon be available on all webOS-based LG AI TVs in seven new markets: Australia, Canada, France, Germany, South Korea, Spain and the United Kingdom. The platform, already successfully launched in the United States, also will now support up to five languages as part of LG’s global strategy to raise the bar for voice control solutions. With the Google Assistant built in, LG’s AI TVs will offer a streamlined experience that allows users to expertly manage daily tasks, find answers to important questions and control compatible smart home devices. IFA visitors can then move on to the IoT living room designed in collaboration with Italian luxury furniture company Natuzzi, a breathtaking living space that was featured at Milano Design Week. This welcoming zone highlights the control capabilities of XBOOM AI ThinQ speakers by illustrating how they can be used to alter the settings of connected sofas and lighting installations. The intelligent InstaView ThinQ refrigerator takes center stage in the culinary-themed ThinQ Gourmet zone. Here, visitors can experience firsthand the advanced capabilities of the refrigerator to recommend recipes and instantly adjust cooking conditions for the connected oven and other kitchen appliances. 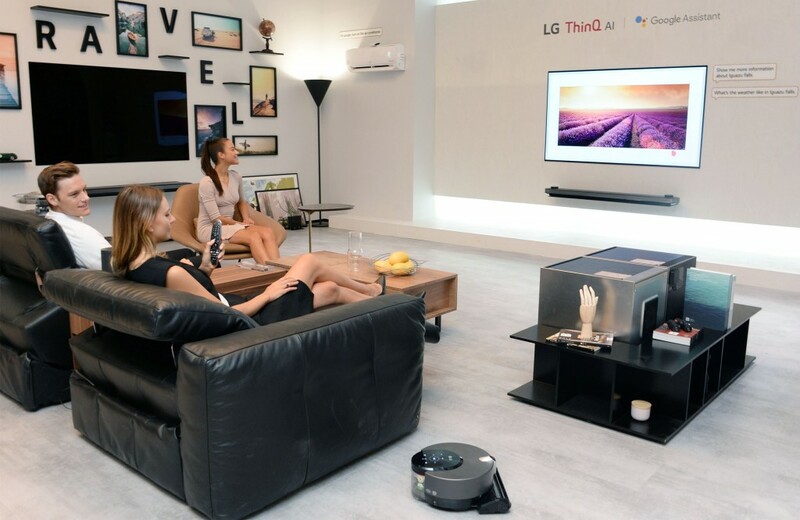 The ThinQ Style zone showcases LG’s wide variety of voice-controlled appliances, including the new LG Styler ThinQ. The latest Styler comes equipped with unique features designed to enhance user convenience while keeping clothes cleaner, more hygienic and stylish – all now achieved through voice commands. Many of the ground-breaking LG products in the three zones were recently recognized by the European Imaging and Sound Association (EISA) for their advanced technology, design and innovation. Across from the LG ThinQ lifestyle experience zones is the core tech zone, highlighting the innovative technology embedded in LG ThinQ products such as LG OLED TVs and LG SUPER UHD TVs as well as the LG Centum System. 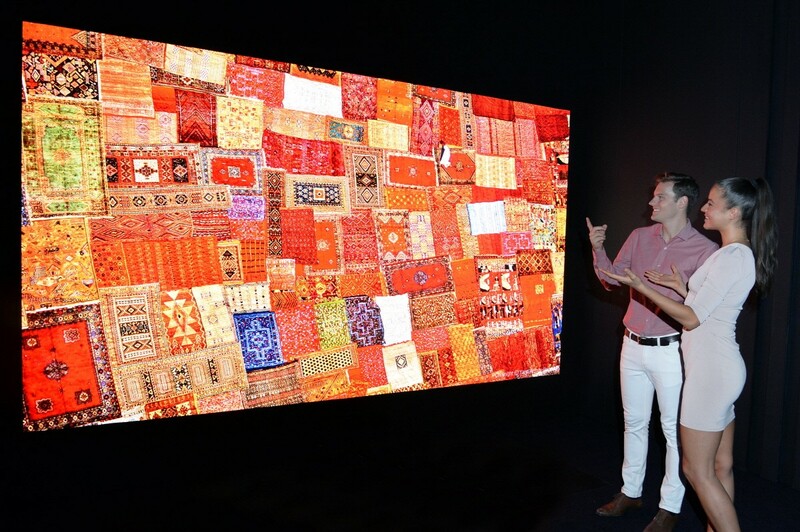 It is here that the 88-inch 8K OLED TV will be featured, with its 7,680 x 4,320-pixel resolution and ability to render deep blacks and vivid colors while also making wide viewing angles possible. Other core technologies unveiled for the first time in this zone include the revolutionary 173-inch Micro LED display, consisting of arrays of microscopic LEDs that form individual pixels. The screen will be located in a dramatic home cinema environment that highlights its ability to customize screen sizes according to user needs. 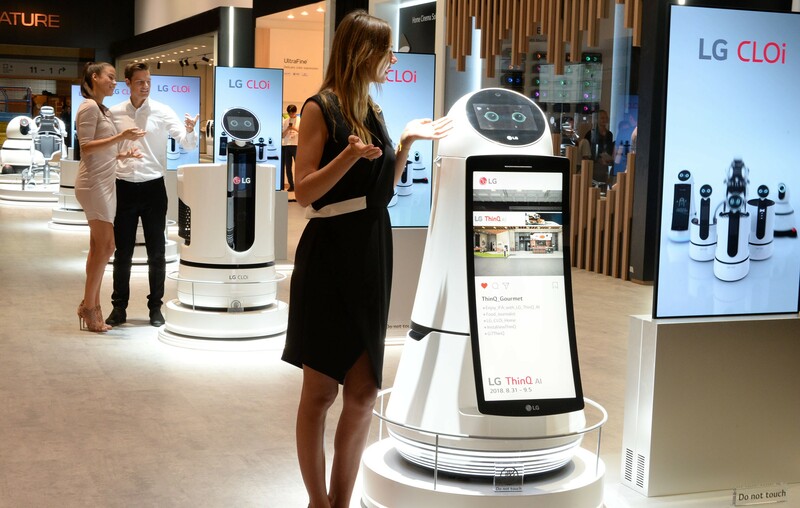 Also featured at IFA will be LG CLOi robots, ranging from serving robots to a wearable robot. This collection of advanced robots will be instrumental in fulfilling LG’s vision for AI both inside and outside the home. LG’s wearable CLOi SuitBot will be on display for the first time in this zone. Ideal for use in industries such as manufacturing and construction, the LG CLOi SuitBot will enhance the quality of life by improving mobility for its wearer. 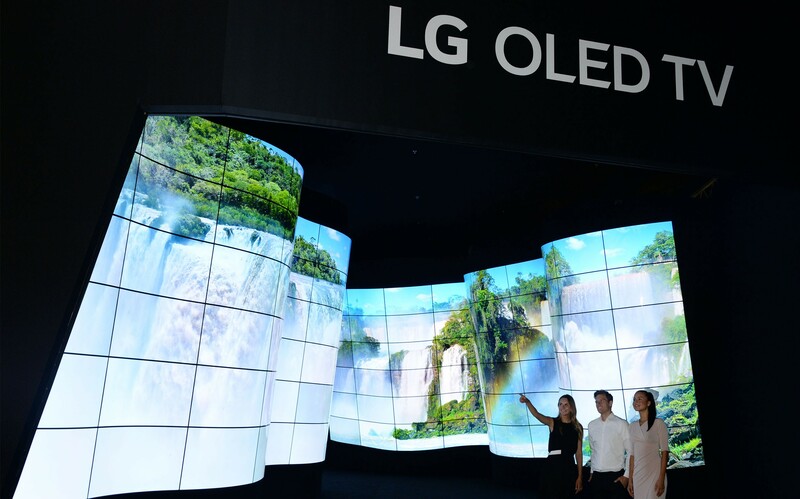 Complementing the attention on LG ThinQ, visitors to the LG IFA booth will be greeted by the awe-inspiring LG OLED Canyon that delivers an immersive dive into awe-inspiring sights from across the world. Five beautiful landscapes – Columbia Icefield, Iguazu Falls, Antelope Canyon, Redwood National Park and Haleakalā – will be displayed in incredible detail across 258 convex and concave commercial open-frame LG OLED panels. New LG SIGNATURE products showcased at IFA include the LG SIGNATURE wine cellar, bottom-freezer refrigerator and dryer – demonstrating the potential of premium appliances in the global market. To highlight the wine cellar’s aesthetic appeal and technological features, LG SIGNATURE will be hosting wine tastings with renowned wine critic James Suckling during the show. Befitting the elegant design of these products, LG is expanding its IFA partnership with London-based art collective Jason Bruges Studio to create a new LG SIGNATURE premium gallery under the theme, One Fine Day. Targeting the European built-in appliance market, LG also will be debuting the new SIGNATURE KITCHEN SUITE luxury brand of built-in kitchen appliances at IFA. 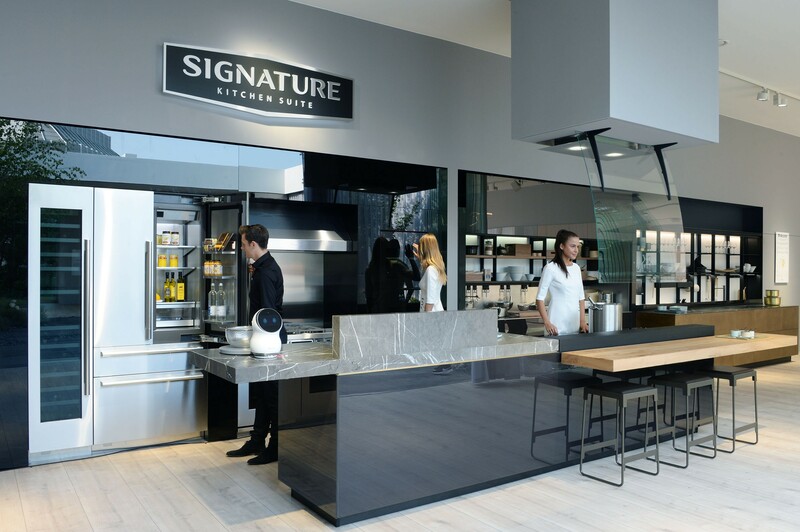 A separate exhibition space dedicated to the SIGNATURE KITCHEN SUITE will be located in a prominent outdoor garden at the center of Messe Berlin. Developed through a collaboration with European luxury furniture designers Valcucine and Arclinea, the SIGNATURE KITCHEN SUITE for Europe will deliver products that build on the tradition of innovative performance and fine craftsmanship. IFA 2018 will open with a visionary keynote address from LG Electronics Chief Executive Officer Jo Seong-jin with President and Chief Technology Officer Dr. I.P. Park. Their joint opening keynote – outlining the strategic direction for the new era of artificial intelligence – represents the first time that senior LG executives have taken on such a prominent role at IFA. Entitled Think Wise, Be Free: Living Freer with AI, the keynote will be delivered on Friday, Aug. 31 in Hall 26b of Messe Berlin. CEO Jo will provide his insights into how LG’s AI strategy will enhance customers’ lives based on LG ThinQ’s unique open platform, open partnership and open connectivity philosophy. Similarly, Dr. Park will show how this technology comes to life in everyday products and how LG’s open AI strategy benefits consumers through its focus on offering greater control and convenience. LG’s IFA exhibition booth is located in Hall 18 of Messe Berlin, showcasing the company’s wide range of state-of-the-art technology designed to deliver Innovation for a Better Life.